MOSCOW, December 27. /TASS/. The Russian military in Syria are distributing humanitarian aid in the run-up to New Year’s Eve dressed as Father Frost (Russian Santa Claus), Head of the Russian Center for Reconciliation of the Opposing Parties Lieutenant-General Sergey Solomatin, said on Thursday. “These humanitarian actions are scheduled until December 31, 2018 to create a holiday mood for Syrian nationals who have returned to their homes,” the general told an expanded session of the Russian and Syrian joint coordination headquarters monitoring the return of refugees. 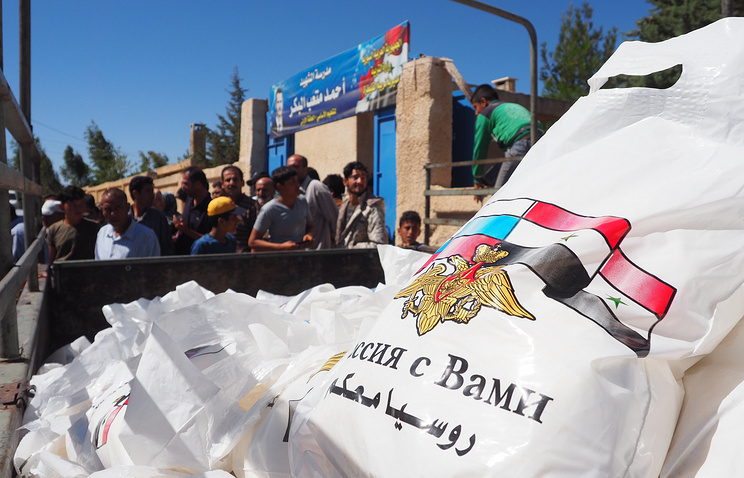 “Over the past month, the Russian side has organized and carried out 18 humanitarian endeavors, in which Syrian nationals received 8,750 food packages totaling over 37 tonnes,” Solomatin said. “In total, the Russian side organized and carried out 2,023 humanitarian efforts, delivering and distributing among the Syrian nationals more than 3,180 tonnes of food, essentials and bottled water,” he added. Health services have been provided to 2,796 local residents this month. All in all, medical specialists from the Russian Defense Ministry provided healthcare services to 102,580 Syrian residents,” the general said pledging that this work would carry on. The Russian reconciliation center continues to fulfill the tasks assigned to them after the completion of the military campaign in Syria. They regularly travel around the country’s liberated areas to assess the humanitarian situation. The main efforts of the Russian military are now focused on aiding the refugees who are returning back to their homes and evacuating civilians from the war-torn country’s de-escalation zones. Hey Buddy!, I found this information for you: "Russian Santa Claus is coming to town: Syrians to ring in New Year with gifts from Russia". Here is the website link: https://russophile.org/russian-santa-claus-is-coming-to-town-syrians-to-ring-in-new-year-with-gifts-from-russia/. Thank you.